On this Martin Luther King day, I’d like to honor the youth in our world who are discovering they CAN change the world! 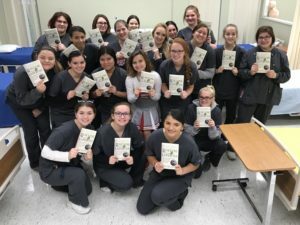 I’m pleased to introduce you to a group of students I’m really proud of – the EHOVE medical careers class in Milan, Ohio. When Rescuing Ladybugs was released in September, I set an intention. I wanted the book to be used as a school curriculum. So when, just a few weeks later, school teacher Kim Davidson contacted me to tell me that she was reading the book to her class, I saw her message as a sign. That class would be the first to try the book as curriculum! Kim agreed and the high school class started reading about animals, heroes, and the compassion movement while learning world geography. I asked them to do me one favor while they were reading, to think about one thing they could do that would make a positive difference for others less fortunate. 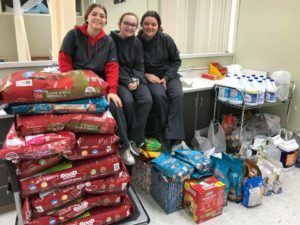 Inspired by their teacher and the heroes in the book, they chose to involve the whole school to fill the rooms of the Huron County Humane Society with pet food, treats, supplies, blankets, and so much more. 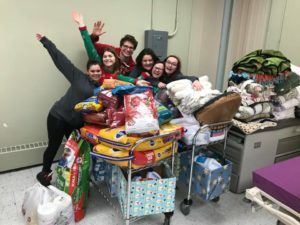 Their holiday drive was so successful they took truckloads of goods to the shelter. In doing this, they realized that when you walk on a path to do good for others, you are joined by an army of people willing to help. I am so very proud of these students. I am so grateful to their teacher for leading the way. The successful quest to do good has inspired them to continue their fundraising by participating in a 5K dog walk/run this spring to benefit the shelter and its homeless and abandoned animals. BRAVO team! If you’re a teacher and would like to use Rescuing Ladybugs as curriculum to inspire your students, please contact me. I’d love to work with you to make that happen.